Let it rain! You no longer have to pack up and head home when a rainshower dampens your hunting grounds. 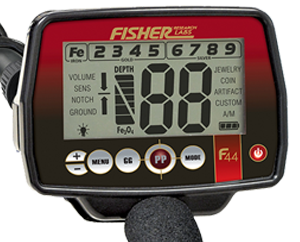 The NEW Fisher F44 metal detector is considered a weatherproof unit because it is resistant to weather, rain, storms, hail, snow, sleet, and high wind. This machine is environmentally sealed for use in the toughest environments and is impervious to splashing waves in beach use, or any kind of water. However, weatherproof does not mean that these machines can be submerged. The manufacturer will not cover damages caused by submersion or even dunking. The Fisher F44 delivers unequaled features at a terrific price point. This model includes a back-lit display screen for hunting in low light conditions and a large 11 inch waterproof search coil. Rain or shine, your Fisher F44 metal detector will be by your side! Download the Fisher F44 Owners Manual and/or place your order by clicking the product link below.